Earlier this month a report was published stating that Intel will outsource some 14nm chip production to TSMC. The Taiwanese industry sources speaking to DigiTimes revealed that Intel had run out of 14nm capacity and wasn't interested in buying more production machinery for this process as it moves towards 10nm. In the background, parties down the supply chain had been noticing various Intel CPUs had started to become hard to find, and prices were starting to rise - simple supply and demand price action. According to a new report "confirmed through multiple sources," Tom's Hardware asserts that Intel isn't going to use the contract manufacturer to solve its supply problem right now. Instead, it has decided to roll back the process technology used to manufacture the H310 motherboard chipset to create the H310C chipset. This product change represents a process roll back from 14nm to 22nm. 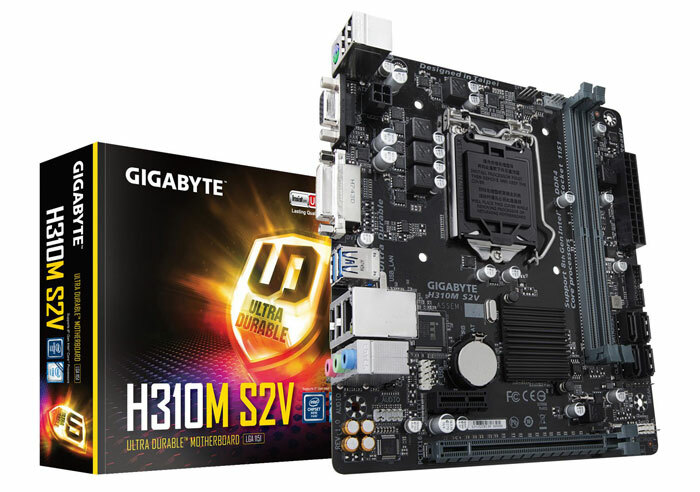 An Intel H310 chipset motherboard currently in retail. Gigabyte's 'M' suffix stands for MicroATX. Intel does usually produce chipsets on a larger node than its current-gen processors. However, as mentioned in our last report, delayed 10nm production has found both motherboard chipsets and processors on the same 14nm node. Leaked images of the new 22nm H310C chipset are already being shared on Chinese tech sites (like MyDrivers) and forums. Some evidence for the process tech roll back is seen in the respective chipset sizes. Tom's Hardware says that the previously seen H310 chipset silicon measured 8.5 x 6.5mm. The new H310C is 10 x 7mm in size. As this physical change alone isn't evidence of a process tech change Tom's Hardware got in touch with several contacts which "confirmed the change". In retail the upcoming 22nm chipset motherboards will be branded as either H310C or H310 R2.0. Performance and power consumption are less of a concern on low end chipsets like the H310, a fact that is used to rationalise the decision to move this particular chipset to 22nm to free up some 14nm capacity. Oooh, I do wonder if this will begin to push up i5, i7, i9 prices…. that would be utterly delicious. I REALLY should have invested in AMD stock. Intel's problems is just like Tesla….management nightmare. Billions of dollars for R&D without good leadership is simply bad business. Lisa Su has proved to be a better leader than any leader intel has ever had. Happens all the time. Company gets a real lead on everybody. They sit back because they can. Competitor comes along with a product that disrupts everything…. AFAICT Intel invested massively in 10nm R&D, I don't think it was lack of effort just that the likes of Samsung & TSMC have better engineers atm.